Lots of beans ready to pick lately. I've come across a couple of good recipes for using them. anyone else have any? Heat oven to 400 degrees. Grease a 10 inch pie plate. Heat beans and 1 inch salted water (1/2 teaspoon salt to 1 cup water) to boiling. Cook uncovered 5 minutes. Cover and cook until tender, 5 to 10 minutes; drain. Mix beans, mushrooms, onion, garlic and cheese in plate. Beat remaining ingredients until smooth, 15 seconds in blender on high or 1 minute with hand beater. Pour into plate. Bake until knife inserted between center and edge comes out clean, 30 to 35 minutes. Cool 5 minutes. Makes 6 to 8 servings. These have a nice nutty flavor. I will definitely be making them again! 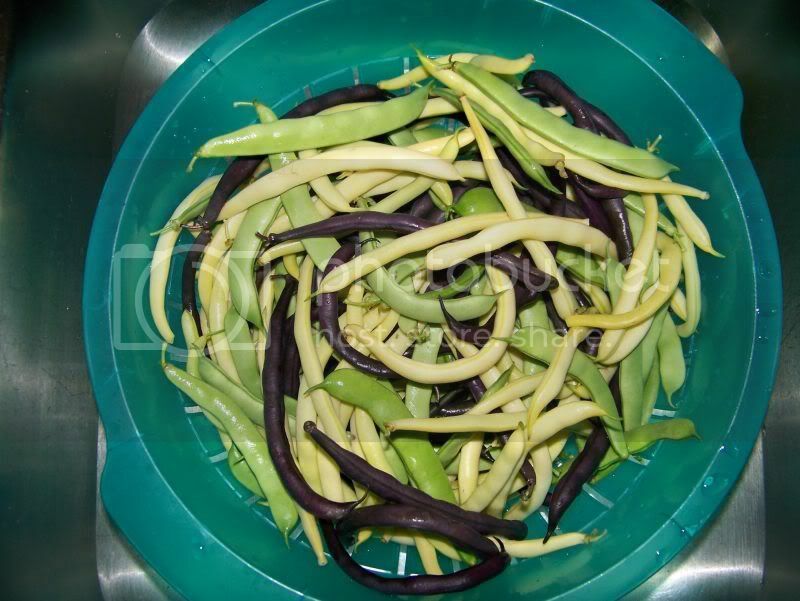 wash, drain and dry green beans (I used a mix of purple, flat pod and yellow wax). Those beans look sooo good. Mine are just starting to blossom here. The heat is hard on them I think. In a pot add cured ham, salty or not. cover w/ water or stock. Season w/s&p, maybe a little thyme that's just me. Simmer for @11/2 hours, till falling off the bone tender. Add beans potatoes, serve when tender. Like alot of dishes... this one is truly comfort food the next day when the beans and potatoes are falling apart. I think this might have been discussed before but I couldnt find it. What is your favorite recipe for fresh green beans? stir-fried with black bean garlic sauce . Sunset Zone 17 Apparently - - - Without the fog! I like them blanched and then sauteed with bacon and onions. I like cold leftover green beans in a salad with sliced tomatoes and chopped shallots with a vinaigrette. There's a Rachael Ray recipe that calls for simmering them in apple juice...can't remember right now what else was in it, but they were so good. boiled with plenty of fat back!!!!!!!!!!! I can't give you measurements. You can figure it out what you need. Have a boiled potato. Cut into bite size pieces. Cook the green beans until just tender. While they're cooking slice an onion very thin. Use as much onion as you like but a little goes a long way and you don't want to overwhelm the other delicate flavors. Chop a clove of garlic--again as much as you like. In a bowl (I prefer a baking dish as it's flat and everything gets coated more easily) you figure will hold everything add the onions, garlic, a couple tablespoons of olive oil, some lemon juice or cider vinegar or rice wine vinegar, add some chopped basil and parsley. Add some fresh mozzarella in bite size pieces. If you have a good tomato, you may add that--no rule prohibiting that. Salt and pepper to taste. You might want to add a pinch of sugar. Let the green beans cool as the other ingredients are marinating. Gently combine the beans and the potatoes with the other ingredients. Refrigerate until cool. Put the beans into a large Pyrex measuring cup or glass bowl, cover with plastic wrap, and microwave for 3 minutes. I shake the beans halfway through so they get evenly cooked. Meanwhile I get a skillet going with some olive oil and a little butter (or I suppose you could fry some bacon ). I drain off any water from the beans and dump them out in the hot skillet. It should sizzle when the beans hit the pan. Add a little salt and pepper and toss the beans every 20-30 seconds or so so they get a little bit of color on the outside. At restaurants, there seems to be 2 choices. Boiled beans which are mushy. And practically raw beans. I like somewhere in between, with some bite to them, but not crunchy like a raw carrot. I think one of my favorite things about cooking at home is serving vegetables which are just slightly crunchy. *I'm not allowed to post weblinks so you'll have to copy-paste it manually. 1. Bring a large pot of salted water to a boil over high heat. Add the green beans and cook for 5 to 7 minutes, until tender. Drain immediately. 2. While the beans are cooking, heat the oil in a medium sauté pan or skillet over medium-high heat until the oil shimmers. Add the garlic slices, distributing them evenly. Cook for 4 to 5 minutes, until the slices become almost translucent and start to brown on the edges; be careful not to let the garlic burn. 3. Add the diced tomato and salt and pepper to taste, then reduce the heat to medium. Cook for 2 to 3 minutes, so that the tomato is heated through. 4. Add the cooked green beans and heat through for 1 to 2 minutes; mix well. Taste and adjust seasoning as needed. 5. Transfer to a serving dish and top with the basil, if desired. Serve warm or at room temperature.